Hand cut dovetails--faster, cleaner, more precise. What's not to like? 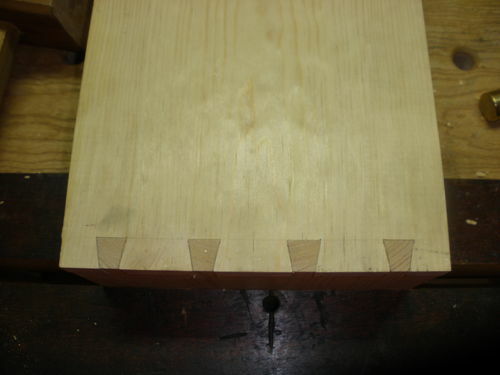 Like many woodworkers, I wanted to learn to make hand cut dovetails, but struggled with getting a precise joint. After some disappointing early results, I was ready to either quit or get some help. Somewhere along the line I had seen a blog post that linked a David Barron video where he used a magnetic saw guide. I decided to bite the bullet and purchase one of the 1:5 guides and hope that helped my joinery. I know that traditionally dovetails are 1:8 or 1:6, but since the ratio is far more aesthetic than functional, I just checked what I had done when laying out freehand. The look I liked came very close to 1:5, so that is what was ordered. The order came very quickly and the guide was well packaged in a small white box. The guide has an aluminum body with two neodymium magnets embedded behind slick tape and the ratio clearly marked. There was also two spare squares of the slick tape, for when the originals inevitably get a bit chewed up. I did that the first couple of times, but now am not having any issues, so the original pieces should last quite a while. It just shows consideration by a vendor to include replacements for the wearable parts. The aluminum is a fairly recent change, as he used to make them in his shop out of wood, but demand got to be too much, so the bodies were outsourced. Doesn’t make any difference in use and is a lot easier to locate quickly on the bench than a wooden one. In order to help the guide stay in place while sawing, the flats are covered with fine grit sandpaper. I first used the guide to just do a few test cuts with a dozuki saw. It seemed to work well, so went ahead and made a test dovetail. Wow, what a difference! As long as you mark clearly, position the guide accurately and don’t overcut the depth, you will get a good joint. With very little practice, you can get extremely precise results. 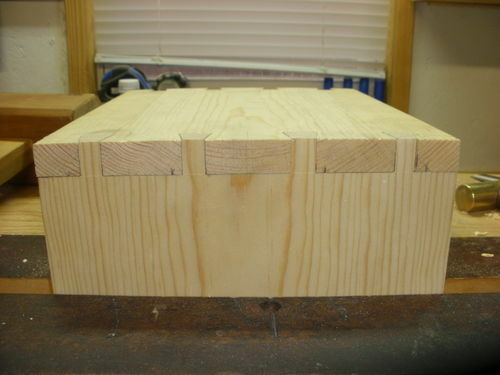 The pic above is only the third dovetail made using the guide and is right off the saw—absolutely no paring other than depth. A couple other angles of the same joint. 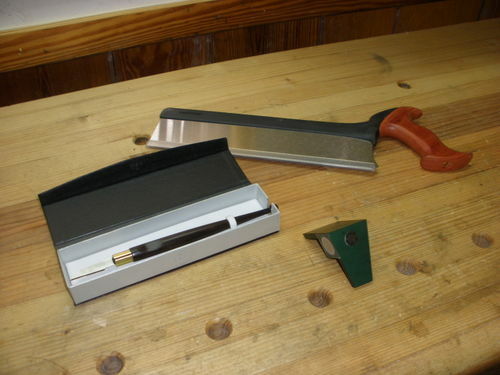 One key for using the guide is a saw with enough plate depth and minimal set. A good dozuki pull saw works well, but I have come to prefer my re-handled gent's saw. It has just enough plate depth to do dovetails in 3/4in thick stock and I like that cutting on the push stroke doesn’t cover the visible marking lines with sawdust. Another factor of using the guide is how much faster you can work. Fewer lines to mark and much less time spent paring adds up quickly. Many times when using a jig, there is a time penalty to set everything up properly, but in this case, with the simplicity, you get to work both faster and better. That’s a win, win. In addition to the quality of the tool, you will not be disappointed dealing with David. He made the ordering process simple and easy, responded quickly to e-mails and shipped immediately. I also purchased one of his Macasser ebony marking knives and the beauty and quality must be seen to be believed. I’ll have to review that one soon. I have heard others refer to using a magnetic guide such as this one as cheating or “training wheels for your saw”. All I have to say to those is that if a small, relatively inexpensive jig will allow someone to create better, more precise joints much faster than before, then give me more training wheels! Interesting to hear your experience. Where did you buy it and how much did you pay? All I see is the UK website. Charles, I just emailed him asking for a price quote including shipping and had a response in less than an hour at current exchange rates—all of his products ship from his shop the UK. Since I just got one quote for both products + shipping, I don’t know exactly how much was charged for each. You could use an online currency conversion calculator to come up with a ballpark idea—at the time I bought it, the price was about the same as the Veritas dovetail guide. I love the Barron jig too and he was a joy to deal with. I can’t believe how quickly this jig improved both the quality and speed of dovetail cutting. 5 stars to David Barron and his jig! Those are some pristine DT’s! Thanks for the review. What is the minimum plate depth needed for 3/4” stock? John, the saw I’m using has a 2” depth of cut and I need to stop a whisker short of hitting the guide with the saw back on 3/4” stock. My dozuki doesn’t have quite as much depth, but was able to get a deep enough cut started (~1/2in) to be able to finish straight without the guide. From the website, the guides are £29 ($50) plus shipping. I found a thread on another forum where some thought the Veritas guide was klunky, others not so much. The magnetic aspect to the one in this review is interesting to me in that it is magnetic, keeping the saw right against the guide. Anyone use the Veritas? Whoops. Just realized the Veritas has magnets as well. There are several reviews for the Veritas here on LJ. Both work on the same principles, I just preferred the simplicity of Barron’s design without the clamp thing. Plus the Veritas is only available in 1:6, 1:8 and 1:4 ratios. 1-5/8” which happens to be the exact depth of my LN dovetail saw. It’s really not an issue though because you can just remove the jig at the end of the cut for more clearance. Also helps you see the base line better.